Season 4 begins immediately after Season 3. It covers the entire story of The Children of Hurin, along with Tuor’s Coming to Gondolin. The story of the Noldor takes a back seat this season, the remaining Noldor appearing relatively few times compared to past seasons. Other storylines covered include Idril and Maeglin, The Wanderings of Hurin, the Nauglamir and Dior and Nimloth. Maglor finally comes to Elrond’s home, Rivendell. Here he tells Elrond and his bright-eyed daughter Arwen the tales of Turin and Tuor. Morwen and Rian care for their children, Turin, Lalaith and Tuor, awaiting word of their husbands. Rian cannot stay in Dor-lomin and leaves to find Huor. She refuses to leave Tuor in Dor-lomin and brings him to the elves of Mithrim. Lalaith becomes ill with the plague. Turin helps Sador with his work. When Turin brings him tools he has stolen, Sador tells him to return them and not to steal. 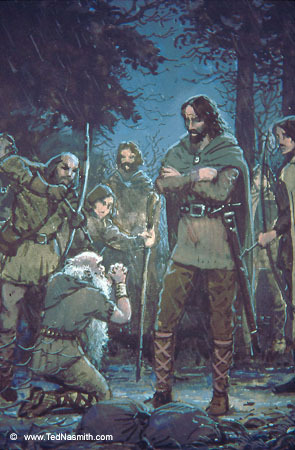 Rian is told of Huor’s death by Fingon’s folk. She abandons Tuor and wanders alone in the wild. 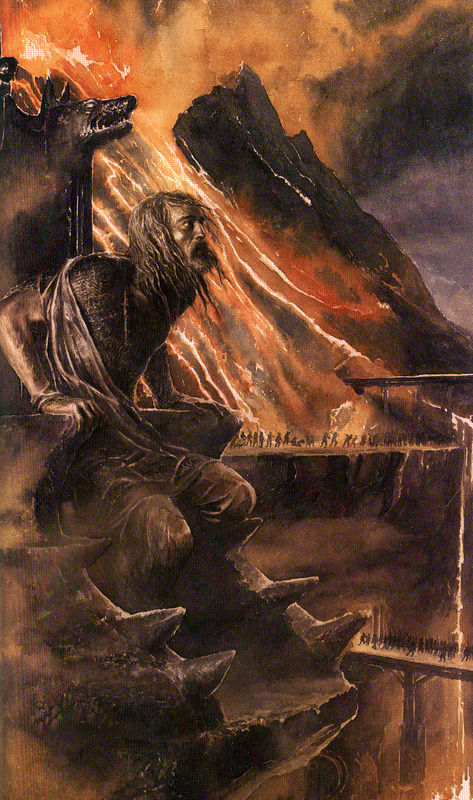 Morgoth chains Hurin to a chair on the foremost peak of Thangorodrim, cursing his kin and forcing him to watch their fate through his eyes after Hurin refuses to give up the location of Gondolin. Gwindor is forced into labour. Turgon is crowned High King of the Noldor. A headstone is erected for Fingon beside Fingolfin’s grave. Easterlings invade the broken realms of Hithlum and Dor-lomin. Many elves and men are forced to flee, many more become slaves. Annael leads his men and young Tuor out of Mithrim and into the caves of Androth. Only three men return from the Battle of Unnumbered Tears. Lalaith dies. A small funeral is held, but shortly after Easterlings ransack their homes. Morwen hides Turin from the Easterlings, as he is the heir of Hador. Morwen along with Sador send Turin away under cover of darkness with two guards. They are ordered to take him to Doriath. Adapted from chapters ‘Of the Fifth Battle’ and ‘Of Turin Turambar’ from The Silmarillion, ‘Of Tuor and his Coming to Gondolin’ and ‘Narn i Chin Hurin’ from Unfinished Tales and ‘The Battle of Unnumbered Tears’, ‘The Words of Hurin and Morgoth’ and ‘The Departure of Turin’ from The Children of Hurin. Tuor in Caves of Androth – ? The Falas are besieged by orcs and Easterlings and quickly overrun. Cirdan, Gil-Galad and others escape by ship. Morwen realises she is pregnant with Hurin’s third child. Sador lives with Morwen, aiding her while she is pregnant. The leader of the Easterlings, Brodda, claims lordship over the remaining people. Turin journeys through the secret way over Ered Wethrin to Doriath. 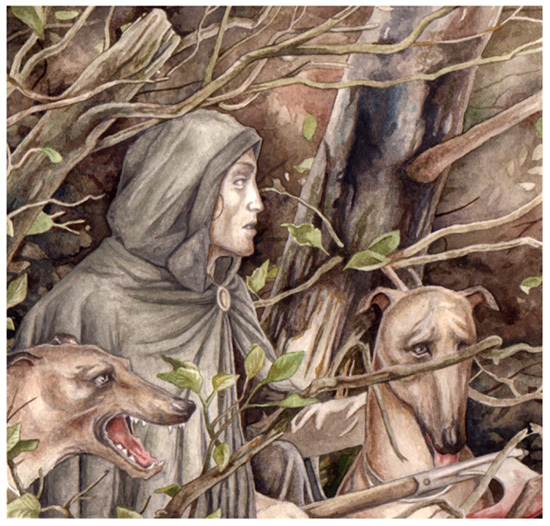 Turin and his guards become entangled in the Girdle of Melian, where they are found by Beleg. Beleg takes them to Menegroth. Thingol welcomes them. He agrees to foster Turin in honour of both Hurin and Beren. Melian instructs Nellas, an elf-lady, to take care of Turin. Turin has been trained by Beleg into a great warrior. He joins Beleg on the borders of Doriath. 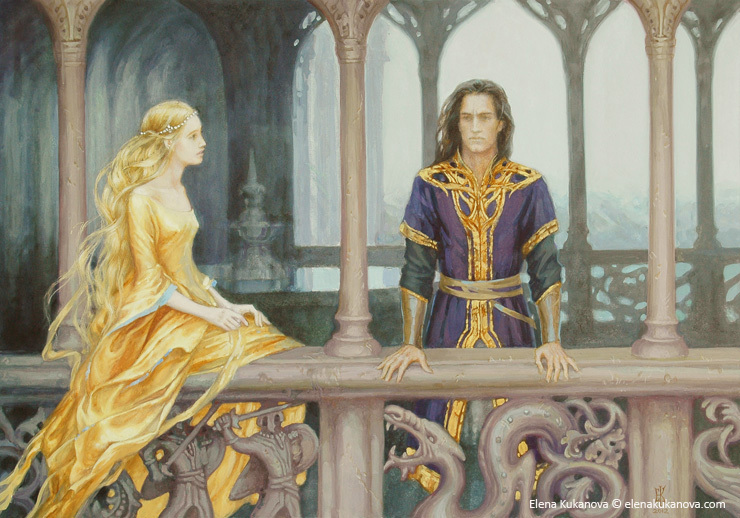 Thingol tells Turin all news from Dor-lomin has ceased. Turin requests to bring the fight to Morgoth. Thingol appoints him a Knight of the Sword and returns the Dragon Helm of Hador. 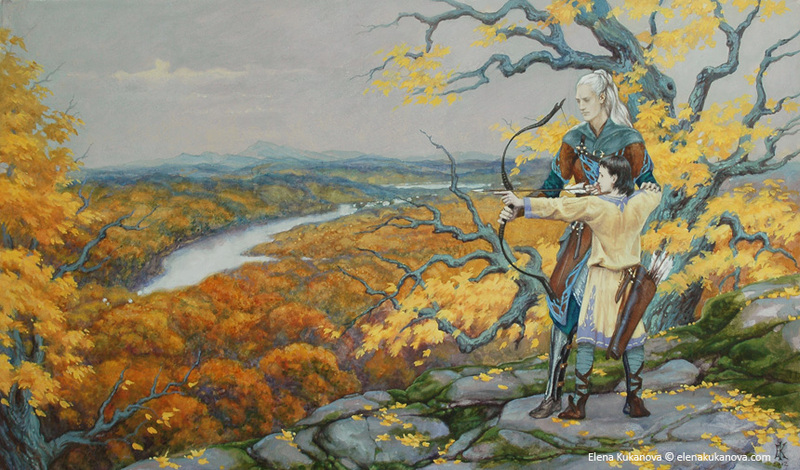 Turin and Beleg go north and join the elves fighting Morgoth’s forces on the borders. Morwen and her daughter, Nienor, remain in service to Brodda. 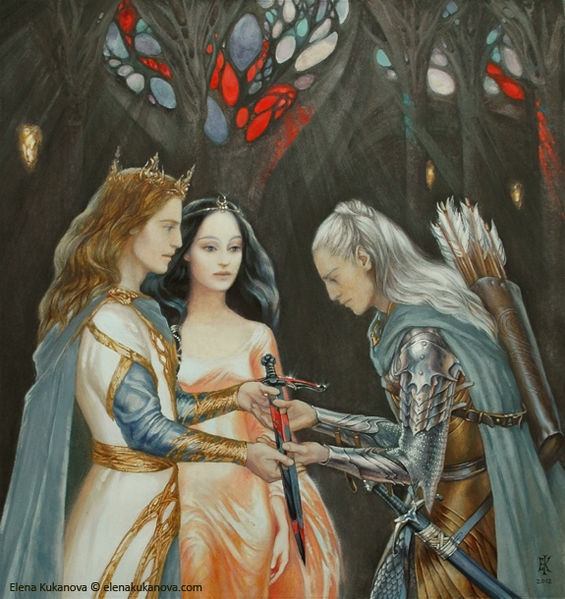 They receive aid from Aerin, a cousin of Hurin forced into marriage with Brodda. Sador overhears rumours of the Dragon Helm fighting once again. Rian, nearly dead from exhaustion, comes to the Hill of the Slain, which she falls upon and dies. Adapted from chapters ‘Of the Fifth Battle’ and ‘Of Turin Turambar’ from The Silmarillion, ‘The Grey Annals’ from The War of the Jewels, ‘Narn i Chin Hurin’ from Unfinished Tales and ‘The Departure of Turin’ and ‘Turin in Doriath’ from The Children of Hurin. 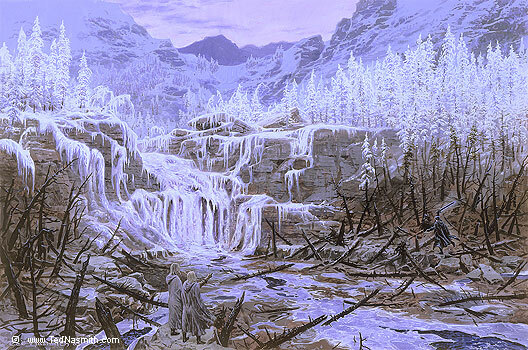 Turin returns to Menegroth at a time Thingol is away. Saeros, one of Thingol’s counsellors, is bothered by a man being in Doriath and while Thingol is absent hurls insults about Turin’s family at him. Turin throws a dish in his face. Saeros attacks Turin the next day, but is overpowered. Turin forces him to run naked through the woods. 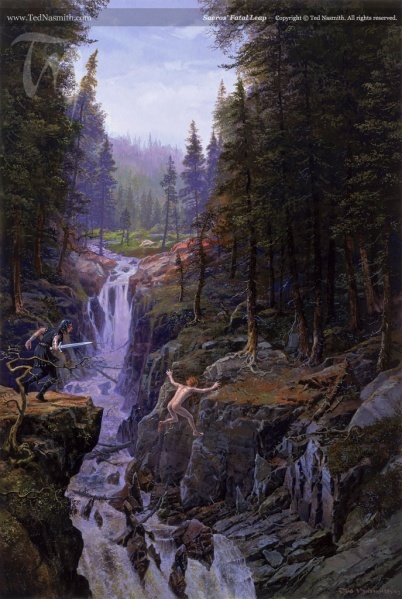 Mablung chases calling for him to stop, but Saeros attempts to jump over a gorge and falls to his death. Mablung wishes for Turin to return to Menegroth for trial, but Turin refuses and outcasts himself. Beleg returns to Menegroth and hears of the deed, but refuses to believe Turin would murder someone. When Thingol returns he holds trial for Turin. On the verge of outlawing him, Beleg returns with Nellas, who is a witness to Saeros’ assault. Beleg requests to bring Turin back. Thingol sends him with the sword Anglachel. Turin comes across a band of outlaws, the Gaurwaith. They surround him with bent bows. A man fires at Turin, who ducks and then kills him with a perfectly timed stone throw. Forweg, the leader, allows Turin to take his place. The sons of Feanor roam the wild, debating their next move. Celegorm wants to sack Doriath as he swore he would, but Maedhros does not. Nienor matures into a woman. She is noticed by Lorgan, an Easterling chieftain, who plans to force her into marriage. Aerin is beaten by Brodda when he catches her aiding Morwen. Annael hears word that Cirdan has established a new haven near Sirion. He resolves to leave the caves of Androth. 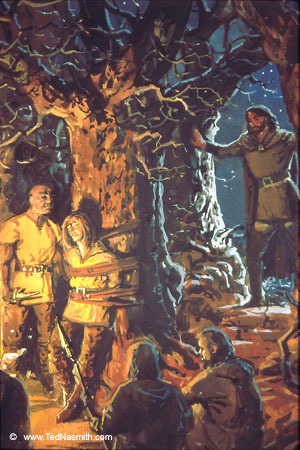 Tuor is taken captive and brought to the house of Lorgan. Maeglin finishes construction on the Seventh Gate of Gondolin, the Gate of Steel. He is eager to show it to Idril, but she is uninterested. Adapted from ‘Of Maeglin’, ‘Of Turin Turambar’ and ‘Of Tuor and the Fall of Gondolin’ from The Silmarillion, ‘Narn i Chin Hurin’ and ‘Of Tuor and his Coming to Gondolin’ from Unfinished Tales, ‘Turin in Doriath’ and ‘Turin among the Outlaws’ from The Children of Hurin. An elf comes to Menegroth, revealed as Dior, the son of Beren and Luthien. 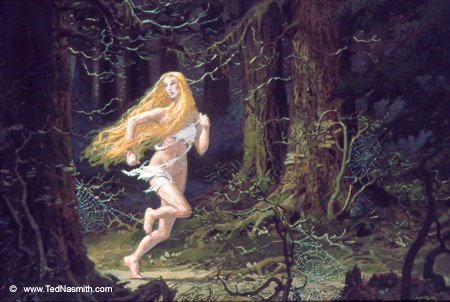 Thingol is overjoyed to have another of his kin in the forest. Turin journeys with the outlaws. The band comes across homesteads that they harass and steal from. Turin does nothing to restrain them. Beleg traces the outlaws through the wilderland. He comes across people who tell him news of Turin. 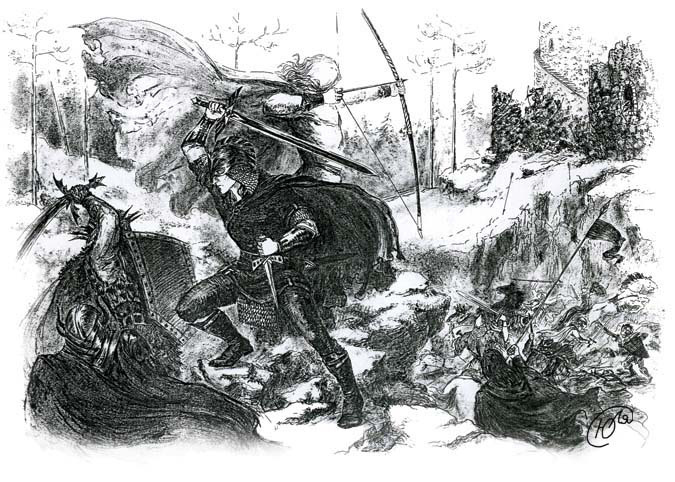 During one raid, Turin tries to save the daughter of a woodsman from being pursued, killing Forweg in the process. Turin takes up leadership of the band. Beleg finally comes across the Gaurwaith while Turin is away. He confronts them about Turin’s whereabouts but instead they capture him. Turin returns and releases Beleg. He berates the men on their actions and declares they shall no longer raid villages of men or elves, their only target now is Morgoth. 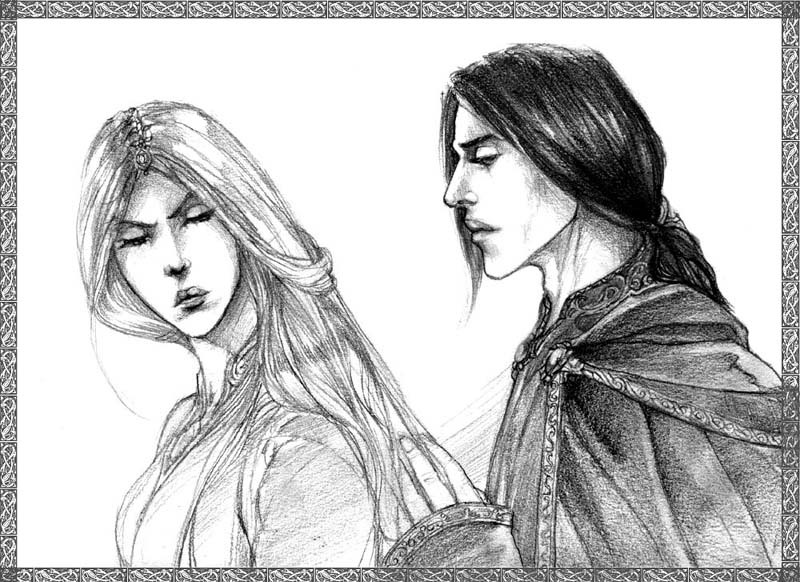 Turin and Beleg speak privately about Turin’s pardon. Turin refuses to return to Doriath and Beleg departs for Menegroth. Morgoth taunts Hurin over his family. He orders Sauron to put a price on Turin’s head. Gwindor kills his torturers and escapes Angband, despite losing a hand. Beleg returns to Doriath and requests to join Turin. Thingol releases him from service. Beleg takes with him the Dragon-Helm. The Gaurwaith find three dwarves and capture them. One, Khim, is wounded by Androg. His father Mim ransoms his life by leading the band to their home, Amon Rudh. Khim dies and the Gaurwaith decide to stay in the caves with the Petty-Dwarves. Beleg finds Turin on Amon Rudh. He brings Turin the Dragon-Helm and stays with him. Sador smuggles Morwen and Nienor out of Dor-lomin. They head to Doriath. Tuor is forced to serve Lorgan. One night Tuor manages to break his chains and escape Dor-lomin. He returns to Androth. Adapted from chapters ‘Of Turin Turambar’, ‘Of the Ruin of Doriath’ and ‘Of Tuor and the Fall of Gondolin’ from The Silmarillion, ‘Of Tuor and his Coming to Gondolin’ and ‘Narn i Chin Hurin’ from Unfinished Tales and ‘Turin among the Outlaws’, ‘Of Mim the Dwarf’, ‘The Death of Beleg’ and ‘Turin in Nargothrond’ from The Silmarillion. The outlaws ambush and destroy several orc-bands. More and more men join the outlaws. Mim’s hatred for Beleg grows too much and he leaves to seek out servants of Morgoth. Mim betrays the location of Amon Rudh to the orcs, who keep his son as a hostage. Mim leads them to his home. The orcs attack the outlaws and drive them inside the cave. They try to escape but all are slain save for Turin and Beleg, who are captured. Turin is taken by the orcs while a wounded Beleg is left to die. Mim prepares to kill Beleg but is scared off by Androg, who manages to free Beleg before he dies. 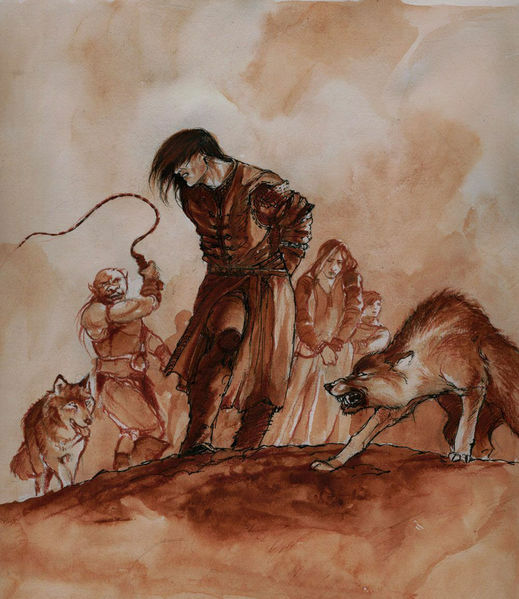 Beleg stitches his own wounds and goes after Turin. He follows the orc tracks and comes across Gwindor. Together they find the orc camp. Tuor ambushes a group of Easterlings near his cave. He slays them all. Tuor comes to the spring near his cave to find it overflowing. The stream flows in a direct line away to the west. Tuor follows it. Beleg dispatches the guards and finds Turin tied to a tree. 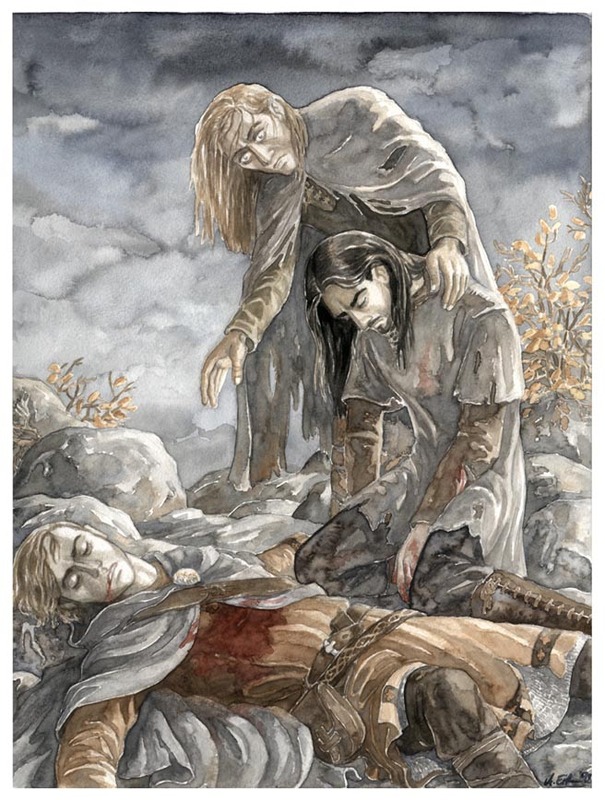 Gwindor and Beleg carry him out of the camp to a thicket of thorn trees. There Beleg attempts to cut Turin’s bonds, but Anglachel slips and cuts Turin. Turin awakes and sees a dark figure bending over him and thinking it’s an orc tormentor seizes the blade and kills Beleg. A flash of lightning reveals Beleg’s face. Turin’s fury is so terrible all Gwindor can do is cower on the ground. 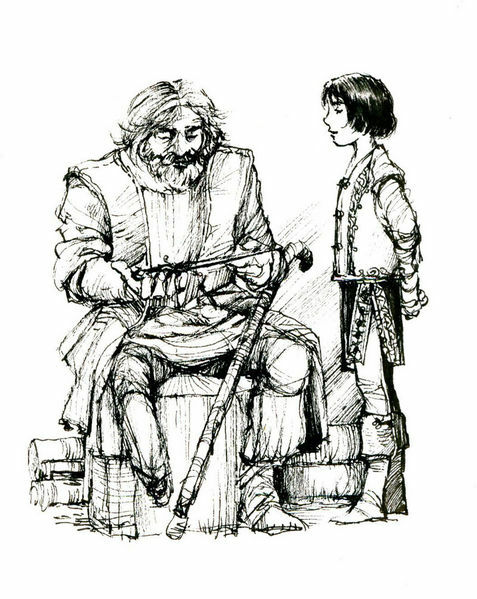 Turin sits unmoving for a long while, before Gwindor rouses him to bury Beleg. Gwindor takes Anglachel. Gwindor leads Turin to Nargothrond. Morwen and Nienor arrive at Doriath, but are devastated to not find Turin there. They stay as guests of Thingol and Melian. Dior courts Nimloth. He also strikes up a great friendship with Galadriel and Celeborn. Ulmo appears to Cirdan and Gil-Galad in their new home. He has a warning for Orodreth. Maeglin asks Turgon for Idril’s hand, but he refuses. He says the Eldar do not wed with kin so near. 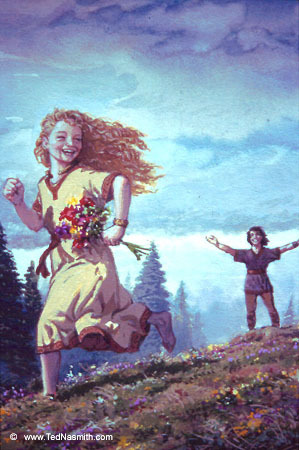 Maeglin begs Idril to run away with him. Idril scorns Maeglin for his dark character, saying she never liked him. 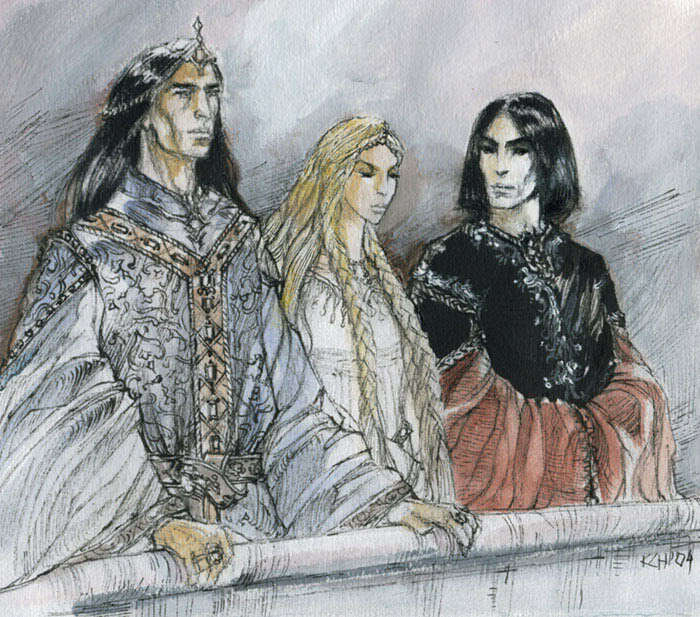 Turgon offers Maeglin the position of his right hand if Maeglin does not bother Idril again. Adapted from chapters ‘Of Maeglin’, ‘Of Turin Turambar’ and ‘Of Tuor and the Fall of Gondolin’ from The Silmarillion, ‘Of Tuor and His Coming to Gondolin’, ‘Narn i Chin Hurin’ and ‘The History of Galadriel and Celeborn’ from Unfinished Tales and ‘The Land of Bow and Helm’, ‘The Death of Beleg’, ‘Turin in Nargothrond’ and ‘The Fall of Nargothrond’ from The Children of Hurin. 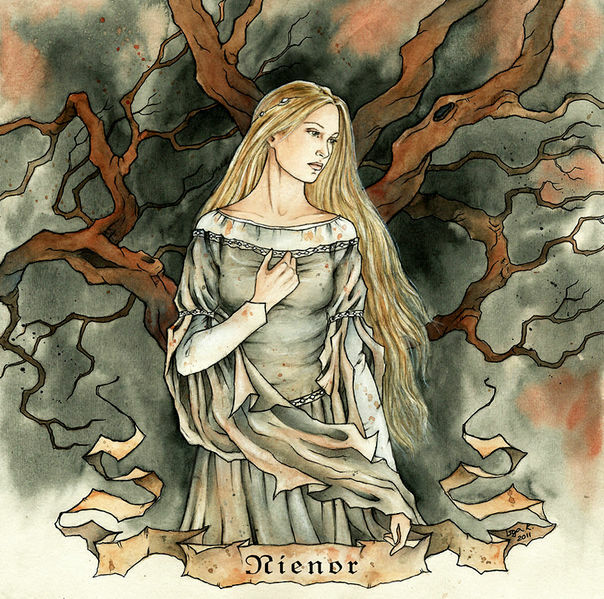 Gwindor is unrecognised by most at Nargothrond, save for Finduilas. Turin introduces himself as the Bloodstained, son of Ill-fate. The elves reforge Anglachel for Turin, who names it Gurthang. Turin wishes to prove himself in battle and does so. Orodreth admits him to his council. 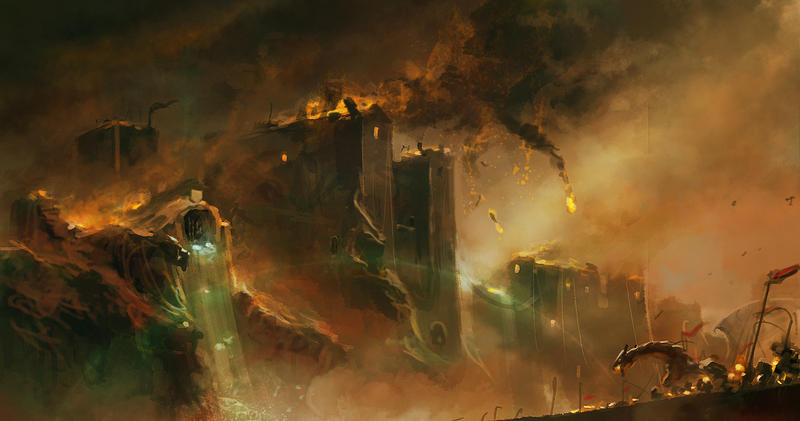 Turin urges Orodreth to abandon their secrecy and strike against Morgoth. Despite Gwindor’s warnings, Orodreth listens to Turin and makes a great number of weapons. A bridge is built over the Narog. Finduilas falls for Turin, who does not return her affections. Gwindor reminds her of his race and his curse. Morwen and Nienor hear of rumours that Mormegil of Nargothrond is Turin. Morwen leaves Doriath alone. Thingol sends riders after Morwen. Nienor conceals herself among them. Mablung finds Morwen and wishes to take her back to Doriath. Morwen refuses. Mablung feels compelled to protect her so goes along with her. Turin grows to command the armies of Nargothrond. Messengers from Cirdan arrive, seeking Orodreth. They carry a message from Ulmo, warning Nargothrond to shut their gates. Word comes of Glaurung heading south. Orodreth and Turin ride out with the army. Orodreth is slain and the elves are defeated. Gwindor is wounded but saved by Turin. A dying Gwindor pleads with Turin to save Finduilas. Turin returns to Nargothrond but Glaurung follows soon after. Glaurung breaks the doors and kills, burns amd captures many inside. Turin stands against Glaurung but is caught in his glare. Glaurung taunts Turin, but Turin manages to break the spell and stab at his eyes. Glaurung retreats. Turin believes the words of Glaurung and leaves to find Morwen and Nienor instead of pursuing the enemy. Tuor follows the stream to Nevrast, Turgon’s old land. He follows seven swans to the castle of Vinyamar, where he finds the shield, armour and sword left there by Turgon. Outside the castle a large storm brews. Tuor goes outside and before him appears Ulmo. 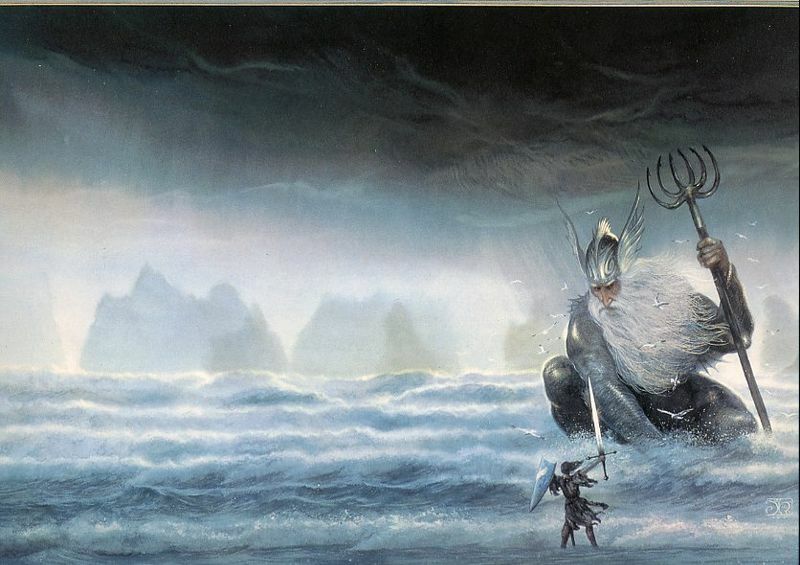 Ulmo has Tuor seek out Gondolin, shadowing him with a great cloak. Adapted from chapters ‘Of Turin Turambar’ and ‘Of Tuor and the Fall of Gondolin’ from The Silmarillion, ‘Of Tuor and His Coming to Gondolin’ and ‘Narn i Chin Hurin’ from Unfinished Tales and ‘Turin in Nargothrond’, ‘The Fall of Nargothrond’ and ‘The Journey of Morwen and Nienor to Nargothrond’ from The Children of Hurin. 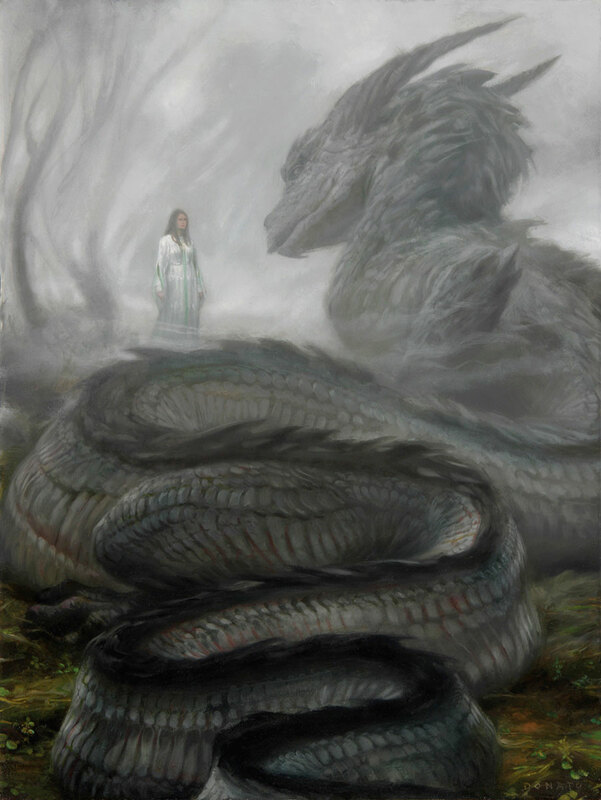 Glaurung returns to Nargothrond, turning the treasure there into his bed. Finduilas cries out for Turin, but hears no reply. Turin speeds to Dor-lomin, but as he went he thinks he hears the cries of Finduilas. Tuor prepares to leave but finds an elf outside the walls. His name is Voronwe and upon hearing of Ulmo’s instruction, gladly guides Tuor to Gondolin. Tuor and Voronwe come across Turin heading north, although Turin does not see them. Turin arrives to find his childhood home empty and dark. He asks for shelter in the house of Brodda. Sador halts Turin and tells him of what has happened. Turin confronts Brodda. Lady Aerin tells him of Morwen’s whereabouts. Turin throws Brodda, breaking his neck. The men of Dor-lomin revolt against the Easterlings, killing all in the hall. Sador and Aerin force Turin to leave. Turin flees Dor-lomin with any rebels that will follow him. 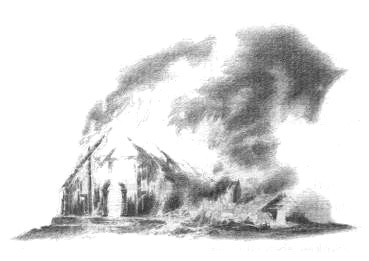 Aerin burns down the hall of Brodda, killing herself in the process. 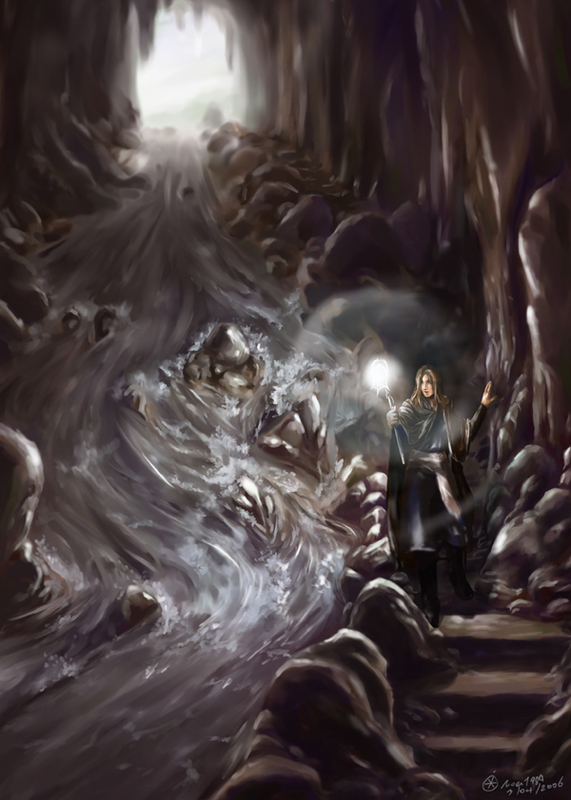 Morwen reaches Nargothrond. Mablung leaves her with a group outside and takes the rest into the city. They awaken Glaurung, who scatters Mablung’s riders and attacks the group outside. Nienor is separated from the others. Glaurung finds her on the hill. With his glare he renders her mind blank. Mablung returns to Nienor alone. Realising her memory is gone, he is forced to lead her back to Doriath by the hand. Turin tries to track the orcs that took Finduilas. The orcs are waylaid by the men of Brethil. They kill all their captives, impaling Finduilas against a tree. She asks the men to tell Turin where she died. Turin comes across an orc host attacking a group of men. He slays them all then asks for word of Finduilas. The men lead him to Finduilas’ grave and then to Ephel Brandir, where Turin stays and meets their chieftain, Brandir. Mablung rests near the borders of Brethil. They are ambushed by orcs and Nienor flees into the forest. Nienor collapses on the Grave of Finduilas, where she is found by Turin. Adapted from chapters ‘Of Turin Turambar’ and ‘Of Tuor and the Fall of Gondolin’ from The Silmarillion, ‘Of Tuor and His Coming to Gondolin’ and ‘Narn i Chin Hurin’ from Unfinished Tales and ‘The Return of Turin to Dor-lomin’, ‘The Coming of Turin into Brethil’ and ‘The Journey of Morwen and Nienor to Nargothrond’ from The Children of Hurin.